Dr Noor Hasmini is Assoc. Professor of Marketing at Universiti Malaysia Kelantan (UMK), Malaysia. She’s formerly the Assoc. 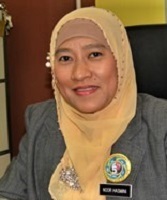 Professor of Marketing at Universiti Utara Malaysia (UUM), Malaysia (2000-2017). Her main research interest is concerned on branding context. In relation, she’s also interested in the area of relationship marketing/CRM, market orientation, market segmentation and service marketing. Part of her publications has appeared in Young Consumers, Academy of Strategic Management Journal, Research, and others. She’s actively involved in supervision of PhD, DBA and MBA students. Besides, she’s also active as a trainer in the context of Branding, Service Quality, and others related.